Tibetan Prayer Flags are a long tradition dating back to ancient Tibet, China and India. Today, the practice has expanded and gained popularity in the West. It is a beautiful way to offer prayers and send energy out into the Universe. Prayer flags contain deeply spiritual symbolism, are considered holy and should be treated with great care and respect. In Tibet, the word for a prayer flag is Dar Cho. “Dar” means to increase life, health and good fortune. “Cho” is a word for all sentient beings. The purpose of the prayer flags then is to bring harmony and increased abundance to all. Flags are brightly colored and feature various symbols, mantras, sutras and prayers. Mantras are sounds that carry specific vibrations designed to influence the invisible energies that govern the Universe. If you have heard the “OM” chant, then you are familiar with the power of Mantras to connect us with the Divine energy that links us all together. Prayer flags may also contain other symbolism like the eight auspicious symbols, the dorje, the four dignities, and others that enhance the focus and meaning of the prayer offerings. Prayer flags come on ropes and can be hung horizontally or tied to vertical poles. Most are printed on 5 different colors of cloth and come in multiples of five. The colors are presented in a specific order: blue, white, red, green and yellow, and represent the five elements. According to Tibetan tradition, balancing these elements leads to increased health and harmony. When hanging prayer flags, it is considered most important to focus on proper intention and not selfish motivations. 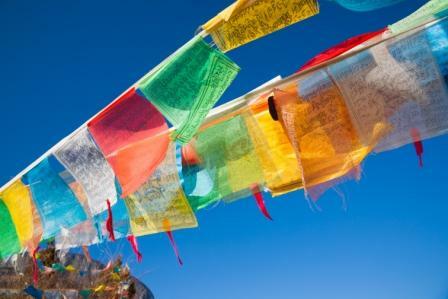 As you hang your prayer flags, consciously send blessings out to all beings everywhere. If you have a specific healing request, it is fine to write the person’s name on a flag before hanging it, but always keep the focus on the benefit of the whole. Most hanging ceremonies involve a period of prayer and thanksgiving prior to raising the flags. Traditionally, it is considered the most auspicious to hang prayer flags in the morning on a sunny, windy day. In addition, there are many Astrological dates throughout the year considered inauspicious, and hanging flags should be avoided on these days. Prayer flags will naturally fade in the sunlight over time. They can be left to naturally disintegrate, or properly disposed of in a respectful manner. They should never be allowed to touch the ground, nor should they be discarded in the trash. The traditional method of disposal is burning, allowing the smoke to carry the blessings out into the Universe.